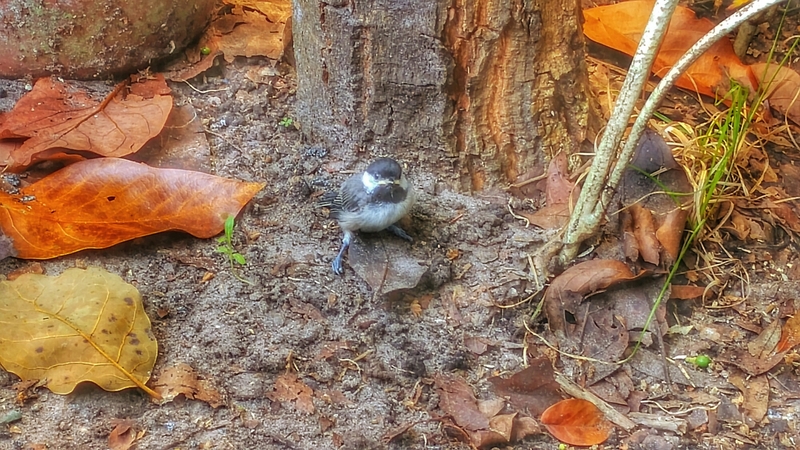 Congratulations Little Birdy; your first day out of the condo and you are going places. Once the morning dew drops dried out you skiped about the courtyard fluttering your small wings. By noon the art of hopping had been mastered, but you were weak; it had been a long morning. A few chirps a mother could recognize and you had a rotating supply of plump worms delivered to your position far away from the nest, by two caring adults. Strength regained and confidence bolstered by the mornings experiences and the quick action of nearby adults you take flight, and fall straight to the ground. That’s when you looked up, saw the camera and flew back to your nest. You’re welcome.